Martin Jugadai is an Aboriginal man who lives at Haasts Bluff in Central Australia. He is currently employed by the Royal Flying Doctor Rural and Remote Mental Health Service as a Cultural Consultant. He has been working in this capacity for over 7 years and travels to the communities of Papunya, Mt Liebig and Kintore. Martin is also a Ngangkari (Traditional Healer). He was recognised at the age of 14 and has been under the guidance of his teachers since that age and is constantly increasing his knowledge and skills to treat Aboriginal people with physical and mental health issues. 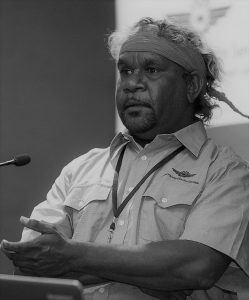 Martin is also attending Batchelor Institute in Batchelor NT. He was a founder of the Men’s Tjilirra Movement.